Before you try building a Chumby OpenEmbedded kernel using Ubuntu, I have one bit of advice: Don’t. Use Debian. I’ve had email from a couple of people indicating they had problems building the Chumby OE kernel under Ubuntu, but until now I’ve not tried it myself. This came up again recently, and I thought I would check it out for myself. I haven’t used Ubuntu much; isn’t it just Debian in OSX clothing? No? Well the Ubuntu website says Debian is ‘the rock upon which Ubuntu is built’, so I assume they are married or something. I applied a workaround in gmane.comp.handhelds.openembedded and moved on. And so on… Initially I thought I would create a project fork to support Ubuntu 12, but after continuing like this with several more breaks I could see no end in sight so I abandoned that idea. Honestly if you are going to put a bunch of work into this project, it would be smarter to port it to the new oe-core framework. Or just use Debian, okay? The Chumby Forums Are Gone? Spoiler alert: no, the forums are not gone. It was back, but it looks like problems with the anti-spam feature are not fully resolved. Thanks to Duane for his hard work getting the forum back up. Following close on the news that Chumby Industries has stopped trading, today their incredibly useful discussion forum has gone off-line. That’s bad news for folks looking to keep their Chumby alive as the ecosystem shuts down, and for those of us who have been using the forums to collaborate on kernel development and the OpenEmbedded image. Zurk’s offline firmware is available on sourceforge, and of course my OE resources are still available on github. At the moment the Chumby source files are still available, but given where things seem to be headed, I’ve taken the precaution of taking a snapshot of that server. So what’s next? If you want to be part of the Chumby community maybe the dormant Chumby Users Group is the place to start. Nope, the Google group appears to be dead, new posts are not being propagated. The Chumby Hacker Board has a 5-way Panasonic EVQQ7(Datasheet) dpad joystick on one corner at SW400. This post explains how to read the state of this switch via the GPIO interface. Holding the CHB such that the switch is in the south east corner as pictured here, switch A closes when the stick is pushed east, B is south, C is north, D is west and E closes when the stick is depressed. Sad dpad is sad. The following table lists the signals and pin addresses for each of the switch contacts A-E.
Each of these inputs is pulled high, and driven low when the switch is closed. 1nF capacitors on each signal line prevent switch bounce. // value_E will be 0 if the switch is open, 1 if the switch is closed. Complete sample code for reading the state of all 5 switches is available in the Chumby Sampler. The size is in Kbytes and is set a little smaller than the final card size to allow for overheads like the boot loader. cfdisk is available on the default chumby-oe image, and provides a reasonably friendly interface for adding a partition. Type yes in response to Warning!! This may destroy data on your disk! Edit fstab. The example below will mount the new partition as /media/card. You cannot run this procedure while the device is mounted, so you will need to run this process on another machine (or on a USB SD adaptor on your chumby). Note that connection labels correspond to the identifiers on the Version 1.0 schematics. 5VDC Power : Requires a regulated 5VDC power supply, positive tip, 3.5mm OD, 1.4mm ID barrel jack (aka a 3.8mm or 4mm connector). 500 mA max for charging a Lipoly battery. Li-poly battery connector : JST B3B-EH-A connector. If powering from a Li-poly, USB0 will be powered, 1 and 2 will not. Note that the power to this port (and P500?) is software controlled and may be off at power-up. It can be enabled as explained here. DPad switch type EVQQ7. The Data sheet is available. Sample code is available. A Freescale MMA7455L 3-axis accelerometer with adjustable sensitivity from +-2G to +-8G is accessible over I2C at device address 0x1D. The Datasheet is available, sample code is available. 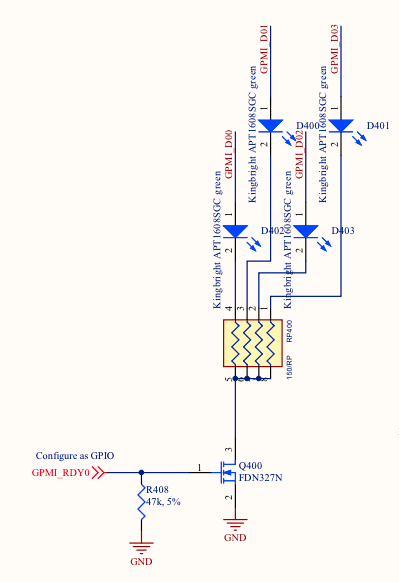 Importantly, before any of the LEDs can be used, the transistor on GPMI_RDY0 must be turned on to ground the LEDs. The CHB has an on-board Freescale MMA7455L 3-axis accelerometer, datasheet here, which can be accessed over the I²C bus. Not long after the Chumby Hackers Board was released Adafruit published a tutorial explaining how to access the accelerometer over i2c. I’ve added some i2c tools to the OpenEmbedded image, so as well as compiling the tools in the Adafruit tutorial, you can use the packaged i2c tools (i2cdetect, i2cget, i2cset, i2c) to talk to the accelerometer. The accelerometer is at bus address $1d (decimal 29). The Adafruit tutorial explains that i2c encodes 7-bit addresses in the high 7 bits, so we shift this up 1 bit giving an effective address of 58. So put it into measurement mode, 2g range, we write 0000 0101 binary (5 decimal) to register $16 (decimal 22) at bus address 58. 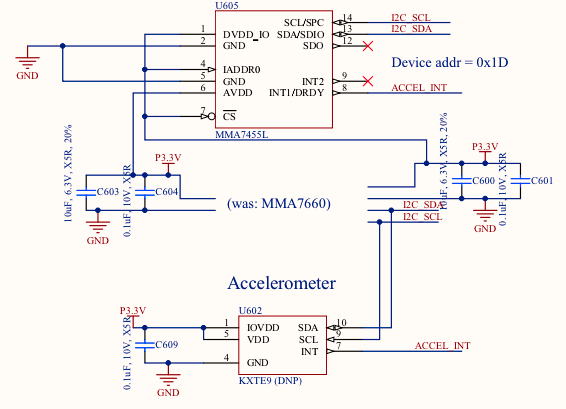 The easiest way to read the accelerometer data is to use the mma7455.c example from the Adafruit tutorial. For convenience you can download the file from here. Now pick up the device and wave it at your office-mates. Watch the numbers change. Say woo-hoo. I have a feeling most people will probably prefer this image over the old chumby-starter-image, so I’ve made chumby-dev-image the default make target. You can change the default target by modifying this line in the Makefile: export CHUMBY_IMAGE:=chumby-dev-image. This is the boot log from the very first boot of the 2.6.28 kernel created by merging the Falconwing source as released by Chumby with the subsequent changes to the 2.6.28 source tree as provided by Freescale. Comparing block [img1] with img1... Found! Comparing block [img2] with img2... Found! Comparing block [krnA] with krnA... Found! boot> linux 0x40008000 "console=ttyAM0,115200 root=/dev/mmcblk0p2 rw rootwait chumbyrev=** ssp1=mmc sysrq_always_enabled logo.brand=BBBBBBBBBBBB"
Uncompressing Linux................................................................................................................................................. done, booting the kernel. [    0.000000] debug: sysrq always enabled. [    0.780000] NTFS driver 2.1.29 [Flags: R/O]. [    0.810000] cryptodev: driver loaded. [    2.280000] stmp3xxx-dcp stmp3xxx-dcp: DCP crypto enabled.! [    2.280000] Advanced Linux Sound Architecture Driver Version 1.0.18rc3. [    2.320000] oprofile: using timer interrupt. [    2.350000] sysctl net.netfilter.nf_conntrack_acct=1 to enable it. [    2.380000] RPC: Registered udp transport module. [    2.390000] RPC: Registered tcp transport module. [    2.520000] NILFS: Can't find nilfs on dev mmcblk0p2. [    2.600000] EXT3-fs: mounted filesystem with ordered data mode. [    2.600000] VFS: Mounted root (ext3 filesystem). Adding system startup for /etc/init.d/dbus-1. Adding system startup for /etc/init.d/avahi-daemon. Creating Dropbear SSH server RSA host key. To help identify the differences between this kernel and the stock Chumby kernel, here is the boot log diffed against the stock boot log. -boot> linux 0x40008000 "console=ttyAM0,115200 init=/linuxrc root=/dev/mmcblk0p2 rootfstype=ext3 ro rootwait chumbyrev=** ssp1=mmc sysrq_always_enabled logo.brand=BBBBBBBBBBBB"
-Uncompressing Linux.............................................................................................................................................. done, booting the kernel. +boot> linux 0x40008000 "console=ttyAM0,115200 root=/dev/mmcblk0p2 rw rootwait chumbyrev=** ssp1=mmc sysrq_always_enabled logo.brand=BBBBBBBBBBBB"
+Uncompressing Linux................................................................................................................................................. done, booting the kernel. [            ] debug: sysrq always enabled. [            ] NTFS driver 2.1.29 [Flags: R/O]. [            ] cryptodev: driver loaded. [            ] stmp3xxx-dcp stmp3xxx-dcp: DCP crypto enabled.! [            ] Advanced Linux Sound Architecture Driver Version 1.0.18rc3. [            ] RPC: Registered udp transport module. [            ] RPC: Registered tcp transport module. +[            ] NILFS: Can't find nilfs on dev mmcblk0p2. -[            ] EXT3-fs: mounted filesystem with ordered data mode. -[            ] VFS: Mounted root (ext3 filesystem) readonly. -[            ] EXT3-fs: mounted filesystem with journal data mode. +[            ] EXT3-fs: mounted filesystem with ordered data mode. +[            ] VFS: Mounted root (ext3 filesystem). -FATAL: Module snd_soc_stmp3780_devb not found. -[            ] Chumby timerx driver version 3.0-Falconwing initializing (bunnie@chumby.com)... show me your jiffies!!! + Adding system startup for /etc/init.d/dbus-1. + Adding system startup for /etc/init.d/avahi-daemon. -Portions copyright (C) 2005-2010 Chumby Industries, Inc.
+Starting system message bus: dbus. +Creating Dropbear SSH server RSA host key. +Starting Dropbear SSH server: dropbear. +|   |   |-----.-----.-----.| |   .----..-----.-----. Insert the microSD in the SD adaptor and insert it into the SD slot on your Mac. You will get a popup warning saying The disk you inserted was not readable by this computer. Click Ignore. Use diskutil to find the device name. Look for the 1GB disk with 4 Linux partitions. If you missed the instructions above and clicked Eject instead, it will not be listed here. In my case this identifies the device as /dev/disk0. Unmount the disk. Be patient, this takes a while… like 6 and a half minutes in my case. Perhaps you would like to amuse youself by looking at pictures of cats? modified the cable as per the AdaFruit tutorial. The device name starting with tty.usbserial is the one we are looking for. You should now have a full-screen console. To exit, type ctrl-a ctrl-k. When you are asked Really kill this window [y/n] type y.